"Zacchaeus," said Jesus, "come down at once, for today I must stop at your house." HERE WAS LIVING in Jericho at the time a rich man named Zacchaeus, and he was chief among the publicans. He had never seen Jesus, and when the news came that Jesus was passing through Jericho on his way to attend the Passover Feast in Jerusalem, Zacchaeus determined that he would try to see this wonderful man. So down to the highway Zacchaeus went, hurrying along with the gathering crowd; for Jesus was to pass that way. 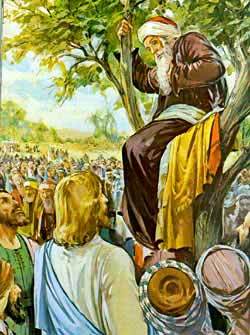 But Zacchaeus did not stop when the crowd stood still. He hurried a little farther on, and there he climbed into a sycamore-tree, which grew by the roadside. From this place he knew he could surely see Jesus when he passed by. If he had remained in the crowd he could not have seen the wonderful man from Galilee, for Zacchaeus was not so tall as the other people about him. Soon the travelers bound for Jerusalem came down the road, and the people of Jericho, who had gathered to watch them pass looked eagerly to catch a glimpse of Jesus. On the travelers went till they came to the sycamore-tree, and here Jesus and his disciples stood still. Then Jesus looked up into the tree and saw Zacchaeus clinging to its branches and gazing down upon him. How surprised Zacchaeus was to hear these words! He had hoped to catch at least a glimpse of Jesus; now he could take this wonderful man into his home and talk face to face with him. With a joyful heart Zacchaeus led the way to his home, to entertain Jesus and his disciples there. And as they went, others followed, some finding fault because Jesus was going to stop in the home of a publican, whom they called a sinful man. The Pharisees would not enter such a house, for they despised people they called sinners and would not be friendly with them. Although Zacchaeus was a publican his heart had been changed by the kind words of Jesus. So he stood up before Jesus and said, "Behold, Lord, I give half of my goods to the poor, and if I have in my business dealing taken more from any man than I should have taken, I give him back four times as much as I took from him." Jesus was pleased with Zacchaeus; for he knew this publican really had been changed in his heart. And he said, "Today salvation is come to your house, for the Son of man is come to seek and to save those who are lost." He had known about this publican who longed to see him, and he had sought for Zacchaeus. Now he would grant him forgiveness because Zacchaeus had received him gladly, and had confessed his willingness to make his wrong right. "A certain nobleman went away to a far country to receive for himself a kingdom and to be made the ruler of it. Before leaving home he gave a sum of money, called a pound, to each of his ten servants and commanded them to use the money till his return. "After some time the nobleman came back again, having received the crown and the kingdom in that far-away country. Then he called his ten servants and asked them how they had used the money he had given to them before he went away. "Then came the third servant, bringing only one pound, the same one that the nobleman had given him before he went away. 'Here is your pound,' the servant said, 'I have kept it wrapped in this napkin all the while you were away for fear I might lose it. I know you are a harsh master, taking up what you do not lay down and reaping what you do not sow.' With this servant the nobleman was much displeased. He answered, 'If you know I am a harsh master, why did you not put my money into a bank that I might have it and its gains at my return?' Then he commanded those who stood by to take the one pound away from the unfaithful servant and give it to the one having ten pounds. "The servants were surprised, and they said, 'Lord, he has ten pounds, why give him more?' But the nobleman answered, 'To every one who uses what he has, more shall be given; but those who refuse to use what is given to them shall have their own taken away.'" After speaking this parable, Jesus, with his disciples, left Jericho and went on the way over the mountains toward Jerusalem.